Many European industries have growing cumulative impacts on the sea, including transport, fishing, offshore energy and tourism. ‘Marine messages’ highlights the vulnerable nature of Europe’s marine ecosystems, which may be irreversibly damaged if they continue to be exploited beyond sustainable limits. European countries need better information to help them understand the nature of these limits, the briefing says. Approximately two fifths of the EU’s population – 206 million people – live in a coastal area, and 23 of 28 Member States have a coastline. 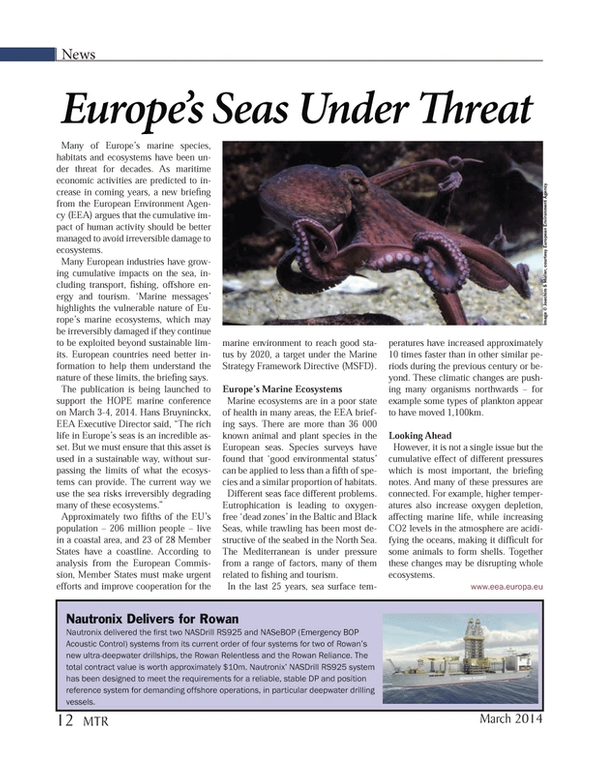 According to analysis from the European Commission, Member States must make urgent efforts and improve cooperation for the marine environment to reach good status by 2020, a target under the Marine Strategy Framework Directive (MSFD). Marine ecosystems are in a poor state of health in many areas, the EEA briefing says. There are more than 36 000 known animal and plant species in the European seas. Species surveys have found that ‘good environmental status’ can be applied to less than a fifth of species and a similar proportion of habitats. Different seas face different problems. Eutrophication is leading to oxygen-free ‘dead zones’ in the Baltic and Black Seas, while trawling has been most destructive of the seabed in the North Sea. The Mediterranean is under pressure from a range of factors, many of them related to fishing and tourism. In the last 25 years, sea surface temperatures have increased approximately 10 times faster than in other similar periods during the previous century or beyond. These climatic changes are pushing many organisms northwards – for example some types of plankton appear to have moved 1,100km.